A memorandum of understanding has been signed between the two paving the way for the selection of a private sector partner to deliver the ambitious scheme. The aim is to have a single developer or consortium appointed with work starting by the end of this year. A prospectus detailing the huge scale of the scheme which will cover the 200-acre site was launched today on the international property stage at MIPIM in Cannes. Salford Mayor Paul Dennett said: “We are looking for the right kind of private sector partner, a partner which recognises the city’s ambition for inclusive growth and development which benefits the people of our city. “The district aspires to be a beacon of planning and design, incorporating modern infrastructure and research and development. 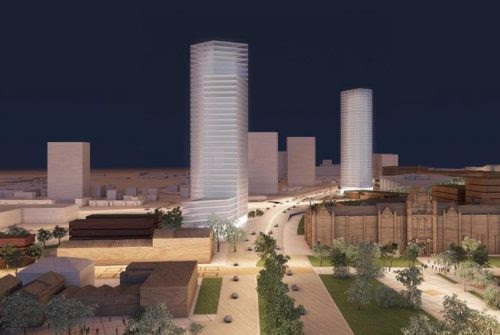 University of Salford Vice-Chancellor Professor Helen Marshall said: “We are looking forward to hearing from developers who truly understand our vision for The Crescent. “Salford is the fastest growing economy in Greater Manchester and our University is the fastest growing in the North West, so we’re looking for a partner whose ambition matches our own. The Masterplan, by 5plus Architects includes housing, commercial and retail and public spaces. CBRE is advising on the process and national head of planning and development Iain Jenkinson, said: “This prospectus presents an opportunity to the market to get involved in one of the largest mixed-use schemes in the UK. “A project for the next 20 years that will be transformative, not just for Salford but for the wider city region. “This Partnership has already shown great vision and we expect huge levels of interest from the private sector to help deliver that vision.